Queen Creek Middle School cares about the environment! 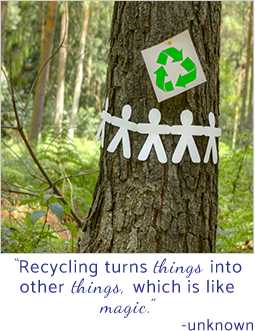 That is why we are involved in recycling ink cartridges and cell phones. Why care about ink cartridge & cell phone recycling? Each year, the United States consumes over 600 million ink cartridges. A small fraction of empty ink cartridges get recycled, but many more end up in landfills. Leaking ink from used cartridges pollutes the environment, and the plastic they're made of takes many generations to decompose. And did you know that it takes up to three quarts of oil to produce a single printer cartridge? Cell phone recycling is also important. Harmless during their usable life, cell phones contain potentially toxic carcinogenic materials that can pose an environmental hazard when disposed of improperly. In addition, precious metals, flame retardant plastics, glass, and other materials go unclaimed for reuse when we throw our cell phones away. When you donate your used ink cartridges and cell phones to Queen Creek Middle School, we earn money for each item we send for recycling. We give this money back into the school for items such as new ink cartridges. Please send your used ink cartridges and old cell phones to school with your child, and ask him or her to drop them off in the office or give them to his or her teacher. Thank you so much for your support!